Do you ever experience pain when walking or running? Are you looking to improve your squat form or break a personal record? 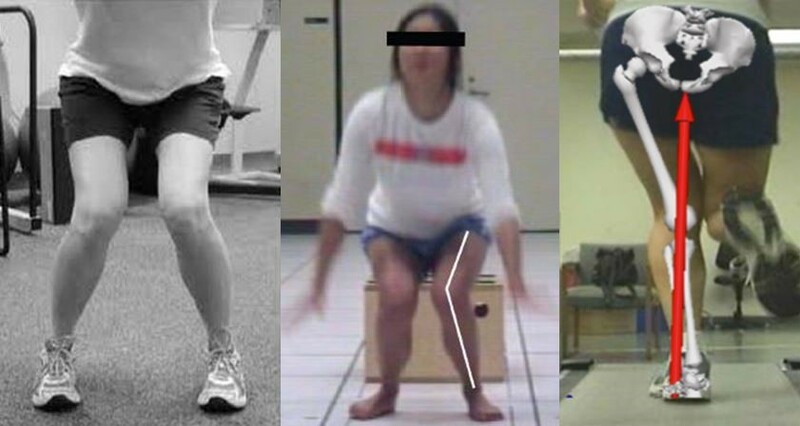 If you answered “yes” to any of these, you may want to take a closer look at the strength of your lateral hips! In particular, your gluteus medius muscle can cause alignment issues at the hip, knee, and ankle that can affect everything from climbing the stairs to running a marathon. With the Tiger 10K this past weekend, some of you are probably motivated to start training for a new race! So here’s some info on the anatomy and function of your lateral hip muscles, to help prepare you train smarter! 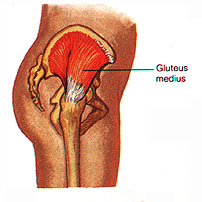 The gluteus medius is a fan-shaped muscle on the side of your hip that lays just beneath your gluteus maximus (buttock) muscle. It’s responsible for hip abduction and stability. 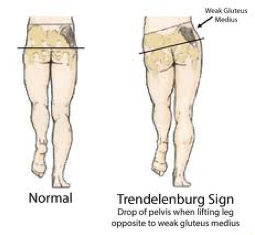 If your gluteus medius is weak, you’ll experience hip drop on the opposite side when you walk, run, or stand on one leg (aka Trendelenburg Sign). Another easy method to tell if your gluteus medius is weak is to perform a squat – if your knees come together on the way down, it’s an indicator your gluteus medius muscle needs attention. Running with weak gluteus medius muscles creates the same inward (valgus) collapse at your knees and is a major contributor to knee pain. It can also cause gradual wear and tear and injury to structures in your knee, like the MCL, ACL, or meniscus. Clamshells: lay on one side with your knees bent and feet stacked on top of each other. Rotate your top knee upward while keeping your feet together. Be careful to not let your hips roll back. Lateral Squat Walks: assume a squat position and side-step while maintaining a small space between your feet. Face the same direction throughout entire exercise to strengthen both hips. Monster Walks: assume a squat position with feet shoulder-width apart. Step forward while maintaining the distance between your feet. Walk backward for an additional strengthening. Hip Series: stand tall and move one leg forward, then out to the side, and finally back behind you. Keep your torso still to challenge stability of the hip, glute, and hamstring muscles. If you’re still experiencing pain, make an appointment with one of our highly-trained therapists! We’ll create an individualized exercise plan with manual therapy techniques, including ASTYM, dry needling, or soft tissue release techniques, to reduce your pain and help you meet your personal goals.